Codementor Support - What is the flat monthly processing fee? All Categories ​>​ I&apos;m a User ​>​ Billing ​>​ Billing Basics ​>​ What is the flat monthly processing fee? What is the flat monthly processing fee? When you buy credits, pay for sessions and freelance jobs, or send a direct payment on Codementor, you're charged an additional 2.85% in processing fees. You can also choose to purchase a flat monthly processing fee instead. 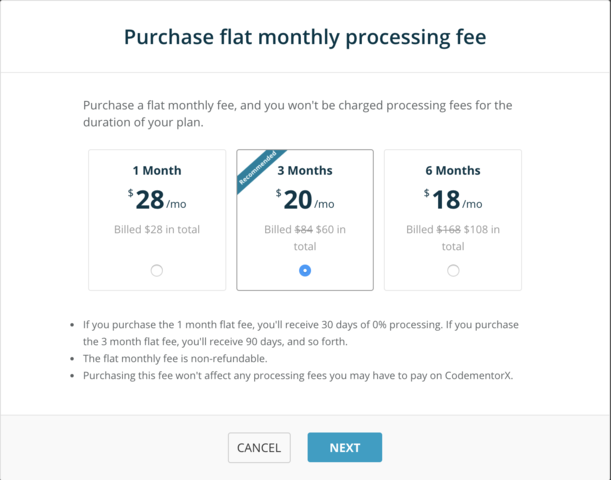 For the duration of your plan, you won't be charged any additional processing fees on Codementor. This plan only covers processing fees and not the original cost of sessions, credits, freelance jobs, direct payments, and CodementorX projects. If you purchase the 1 month flat fee, you'll receive 30 days of 0% processing fee. The 3 month plan will be 90 days, and so forth. Purchasing this fee won't affect any processing fees for CodementorX. This fee only covers processing fees charged by Codementor and not fees charged by your credit card company or bank. The flat monthly processing fee is non-refundable. What are service fees and processing fees? Will service and processing fees be refunded? What is the preview period?